Future generations may treat conditions like Parkinson’s with DNA rather than drugs. By manipulating the DNA within a given cell, researchers can cause that cell to generate proteins that they usually do not produce. This technique is called gene therapy, and it is currently being clinically tested in people with Parkinson’s. Recently, one biotech firm (Voyager Therapeutics) has provided new data on an ongoing clinical trial and another company (Axovant Sciences) has announced the initiation of a clinical study. In today’s post, we will discuss what gene therapy is, evaluate what the first company has achieved, and compare it with the clinical trial that is just starting. At the annual American Neurology Association (ANA) meeting this year, we got an update on an ongoing clinical trial for Parkinson’s being conducted by a company called Voyager Therapeutics. The biotech firm presented data at the meeting regarding their gene therapy approach for Parkinson’s. Gene therapy involves introducing a piece of DNA into a cell which will cause the cell to produce proteins that they usually do not (either by nature or by mutation). The DNA is artificially inserted into cells and the cell’s protein producing machinery does the rest. The introduction of the section of DNA – which provides the instructions for making a particular protein – is usually achieved using carefully engineered viruses. The viruses have had all the disease causing components removed, allowing us to use the virus as an efficient biological delivery system. Viruses by their very nature are very good at infecting cells, so if we remove the disease causing components, what is left is a very effective system of getting whatever you want into a cell. Taking this approach one step further, we can take sections of DNA that contain the genes (these are the instructions in DNA for making proteins) involved with the production of a chemical called dopamine and insert them into our empty virus. Dopamine is a chemical in the brain whose levels are badly affected by Parkinson’s. A severe reduction in dopamine levels results in the need to use Levodopa as a treatment for Parkinson’s, as it helps to resort dopamine levels. By injecting a virus (containing the instructions for making certain components of the dopamine-production pathway) into the brain, we can produce dopamine in any infected cells. So what is the Voyager trial trying to do? Voyager Therapeutics‘s gene therapy product, VY-AADC is an adeno associated virus (or AAV) that carries a piece of DNA which contains the instructions (or a gene) for making a protein called Aromatic L-amino acid decarboxylase (or AADC). AADC is the enzyme involved in the production of the chemical dopamine. Specifically, AADC converts the chemical L-dopa into dopamine. L-dopa is naturally produced in the brain from a protein called Tyrosine which is absorbed into brain cells from the blood. L-dopa is also the basis of many treatments for Parkinson’s (such as Levodopa – commercial versions of Levodopa include ‘Sinemet’). So AADC helps to produce dopamine, but why is dopamine important? Dopamine is a chemical in the brain that helps us to move freely. Without it, our movements become inhibited – as in the case of Parkinson’s. The majority of the dopamine produced in your brain is made in a region called the substantia nigra, deep inside you brain. These dopamine producing cells also generate another chemical called neuromelanin, which has a dark colouration to it – making it visible to the naked eye. As you can see in the image below, the substantia nigra region is easy to see on the section of healthy control brain on the left, but less visible on the section of brain from a person who passed away with Parkinson’s. The dopamine neurons of the substantia nigra release their dopamine in different areas of the brain. The primary regions of that release are areas of the brain called the putamen and the Caudate nucleus. The dopamine neurons of the substantia nigra have long branches/projections (called axons) that extend a across the brain to the putamen and caudate nucleus, so that dopamine can be released there. In Parkinson’s, these ‘axon’ extensions that project to the putamen and caudate nucleus gradually disappear as the dopamine neurons of the substantia nigra are lost. 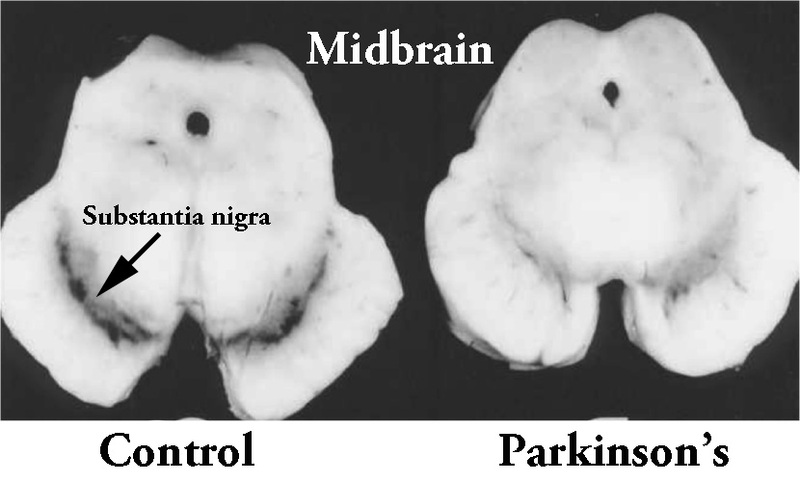 When one looks at brain sections of the putamen after the axons have been labelled with a dark staining technique, this reduction in axons is very apparent over time, especially when compared to a healthy control brain (PLEASE NOTE: The image provided below is an example and may not apply to everyone – people progress at different rates in Parkinson’s). So how does the VY-AADC virus help? By injecting VY-AADC into the putamen of people with advanced Parkinson’s, Voyager is trying to make cells in that region (the putamen) start to produce AADC (which they usually don’t) and this will allow (with the use of Levodopa treatment) for the production of dopamine in the location where it is normally released by the (now absent) dopamine neurons. And this will hopefully help alleviate the motor features of the condition. It must be understood, however, that the approach that Voyager Therapeutics is trialling here will not cure Parkinson’s, but it may make life a lot easier for those affected by it. So what does the update from Voyager Therapeutics report? Voyager Therapeutics announced at the American Neurology Association meeting that VY-AADC was well tolerated, and the positive effects resulting from the treatment have been maintained for at least 36 months (the longest time point assessed thus far). Group 1 had up to 450 µl of VY-AADC01 (at a concentration of 8.3×1011 viral genomes per millimeter) injected into their putamen. The follow-up period for this group has been 36 months thus far. Group 2 had up to 900 µl of VY-AADC01 (at a concentration of 8.3×1011 viral genomes per millimeter) injected into their putamen. The follow-up period for this group has been 18 months thus far. Group 3 received up to 900 µl of VY-AADC01 (at a concentration of 2.6×1012 viral genomes per millimeter) injected into their putamen. The follow-up period for this group has been 12 months thus far. Clinical improvements in treated individuals (as determined by changes in daily dopaminergic treatment of levodopa) showed mean reductions in doses at 12 months of 10.2% in group 1; 32.8% in group 2; and 39.3% in group 3. And impressively, these reductions were also sustained at 18 months in groups 1 and 2. Despite this decrease in Levodopa doses, participants in the study reported a mean improvement of 2.3 hours of “ON” time (that is, time with good mobility and no dyskinesia) at 24 months in group 1. And this improvement was maintained at the 36 months timepoint. Participants in group 2 reported a 3.5-hour improvement in “ON” time, which was maintained at the 18 months assessment. Improvements were found in the mean change in scores using the Unified Parkinson’s Disease Rating Scale III (UPDRS-III), which is a physician-based rating scale. The company believes that these positive results reflect the wider areas of infected cells in the putamen (which was one possible reason many of the early gene therapy trials for Parkinson’s failed). Sounds very interesting. What happens next? 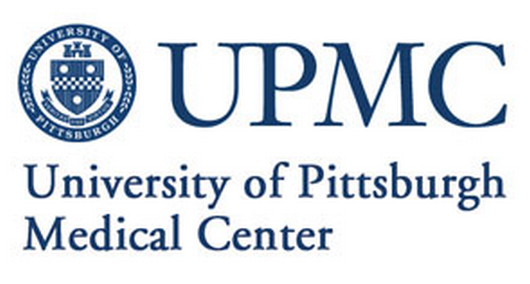 Voyager has an ongoing Phase II trial of VY-AADC which is being conducted at the University of Pittsburgh Medical Center. This new trial is a randomised, placebo-surgery controlled, double-blinded, multi-center, Phase II clinical trial. It is evaluating the efficacy and safety of VY-AADC in 42 people with advanced Parkinson’s with motor fluctuations over a 12 month period. Some of the participants in the study will not be injected with VY-AADC – they will be the placebo-surgery control group and they will be blind to their status. They will wake up from a sham surgery with stitches on their heads, but nothing injected into their brains. The results of that Phase II trial are expected to conclude in late 2020/early 2021 (Click here to read more about this clinical trial). Very encouraging. So what does it all mean? No, we’re not finished yet. Also announced this week was the start of another gene therapy clinical trial for Parkinson’s. This one is being conducted on the eastern side of the Atlantic ocean. Biotech firm Axovant Sciences put out a press release announcing that the first person in their gene therapy trial had been recruited. Axovant Sciences is testing a new version of a previous gene therapy treatment called ‘Prosavin’ (or OXB-101) which was originally developed by Oxford BioMedica. The scientists at Oxford Biomedica designed their virus to transfer DNA containing three genes – aromatic amino acid dopa decarboxylase (AADC – the same as Voyager Therapeutics (above)), tyrosine hydroxylase (TH), and GTP-cyclohydrolase 1 (GCH1). These three genes are all involved in the production of the chemical dopamine. The scientists at Oxford Biomedica were hoping to reprogram cells in the putamen to start making dopamine, and that this reprogramming would result in increased levels of dopamine in the brain and reduce the need for any Levodopa treatment. Title: Long-term safety and tolerability of ProSavin, a lentiviral vector-based gene therapy forParkinson’s disease: a dose escalation, open-label, phase 1/2 trial. Authors: Palfi S, Gurruchaga JM, Ralph GS, Lepetit H, Lavisse S, Buttery PC, Watts C, Miskin J, Kelleher M, Deeley S, Iwamuro H, Lefaucheur JP, Thiriez C, Fenelon G, Lucas C, Brugières P, Gabriel I, Abhay K, Drouot X, Tani N, Kas A, Ghaleh B, Le Corvoisier P, Dolphin P, Breen DP, Mason S, Guzman NV, Mazarakis ND, Radcliffe PA, Harrop R, Kingsman SM, Rascol O, Naylor S, Barker RA, Hantraye P, Remy P, Cesaro P, Mitrophanous KA. Journal: Lancet. 2014 Mar 29;383(9923):1138-46. The clinical study was an open-label trial conducted over 12 months at two research centres (France and UK). It was designed to assess the safety and efficacy of ProSavin after the virus was injected into the putamen on both sides of the brain in 15 people with advanced Parkinson’s. Both research centres were registered as separate trials at ClinicalTrials.gov (NCT00627588 and NCT01856439). ProSavin was found to be safe and well tolerated in the study participants. No serious adverse effects related to the virus (or surgical procedure) were reported, and significant improvements in the motor issues associated with Parkinson’s were found (the average UPDRS score off medication in all of the patients at 12 months had improved from 38 at the start of the study to 27 (p=0·0001). It is important to understand, however, that the first Prosavin study was an open-label trial (meaning a everyone in the study knew that they were receiving the treatment) and thus, there could have been a placebo effect at play (participant experiencing improvements where there may be no actual treatment-based effect). And there was some evidence for this in the first Prosavin study. When the researchers looked at brain imaging data from the study, there was very little difference between brain scans of dopamine processing before the study started and 6 months into the study. Given this situation, following the completion of the clinical study, Oxford Biomedica focused on improving the Prosavin virus. They developed a more potent virus, which they called OXB-102. And preclinical testing indicates that OXB-102 is at least five-fold more potent than ProSavin (based on behavioural and movement analysis). Then in June of this year (2018), Axovant Sciences entered into an exclusive worldwide licensing agreement with Oxford Biomedica to develop and commercialise OXB-102 – now “AXO-Lenti-PD” (Click here to read more about this). And this has led to the start of the clinical trial being announced this week. This new clinical study consists of two parts. Part A is going to evaluate the safety and tolerability of multiple doses of OXB-102 (AXO-Lenti-PD) in people with Parkinson’s. Part B will be a randomised, double-blind evaluation of the best dose from Part A. Participants in Part B will be assigned to a treatment group who will receive the virus or to a control group (who will have a sham surgery). The new Axovant trial will again be conducted in the UK and France, assessing up to 30 people with Parkinson’s. The expected completion date for this study is June 2022 (Click here to read more about this new trial). Two different biotech companies are attempting to alleviate the motor features of Parkinson’s by using DNA rather than drugs. Utilising specially engineered viruses to delivery particular pieces of DNA, these researchers are attempting to encourage cells to do something they usually do not do: generate the chemical dopamine. This approach will ideally allow sufferers to reduce their level of Levodopa therapy and hopefully experience less complications, such as dyskinesias. It is important for readers to appreciate, however, that neither of these gene therapy treatments is a curative strategy. They will only provide symptomatic relief. That said, the technology being used and the surgical protocols being developed may aid us in future gene therapy efforts which may well be focused on slow or halting the condition (Click here for a previous SoPD post on an experimental non-invasive gene therapy attempting this). As to which of the two gene therapy approaches discussed in this post will be the best, it is difficult to say. It is simply reassuring that we have multiple efforts being made. And I am hugely excited by the gene therapy efforts as I see them as the future of therapy not only for PD, but many other medical conditions. EDITOR’S NOTE: Voyager Therapeutics, Oxford Biomedica and Axovant Sciences are publicly traded companies. That said, the material presented on this page should under no circumstances be considered financial advice. Any actions taken by the reader based on reading this material is the sole responsibility of the reader. Voyager Therapeutics, Oxford Biomedica and Axovant Sciences have not requested that this material be produced, nor has the author had any contact with the companies or any associated parties. This post has been produced for educational purposes only. The banner for today’s post was sourced from positivelyaware.